Much work has been done to determine if the building blocks for present biological molecules could have been synthesized early in Earth's history. Amino acids and fatty acids have been found in meteors suggesting the possibility. Earth's early atmosphere would have had little oxygen, so most components should have been reduced. It probably consisted of methane, ammonia, hydrogen and water similar to the atmospheres of other planets in our solar system. The composition of the early atmosphere is still contentious. In 1953 (the same year that Watson and Crick published the structure of double-stranded DNA), Stanley Miller showed that electric discharges (to simulate lightening) in a reducing atmosphere over a "simulated sea" produced many amino acids. Up to 11 different amino acids have been produced in this fashion along with purines and pyrimidines (these required concentrated reaction mixtures) necessary for nucleic acids. Adenine can be produced just through the reaction of hydrogen cyanide and ammonia in an aqueous solution. Other nucleic acid bases can be made with hydrogen cyanide, cyanogen (C2N2) and cyanoacetylene (HC3N). No complex polymers arise through these reactions. However, in 2004, Lehman, Orgel and Ghadiri were able to show that in the presence of carbon disulfide, a gas discharged from volcanoes, homo- and hetero-peptides were produced. Amphiphilic peptides can even catalyze their own formation from peptide fragments, if the fragments are activated. The fragments would bind to the larger "template" peptide through nonpolar actions of the side chains which are oriented along one face of the helical axes. If the fragments bind in a fashion in which the electrophilic end is adjacent to the nucleophilic end of the other peptide fragment, condensation of the two peptide fragments results. The larger template peptide acts as a template (effectively as an "enzyme") in orienting the two fragments for chemical reaction and effectively increasing their local concentration. The reaction of the bound fragments is essentially intramolecular. The reaction even proceeds with amplification of homochirality. Could the prebiotic amino acids have polymerized into a protein that could fold in a fashion similar to modern proteins? That question has recently been addressed by Longo et al (2013). They asked the question whether the amino acids found in Miller-type prebiotic synthesis mixture and in comets/meteors (Ala, Asp, Glu, Gly, Ile, Leu, Pro, Ser, Thr and Val), a restricted set (10) compared to the present 20 naturally-occurring amino acid, could form a polymer that could fold. Notice that this reduced ensemble of amino acids lacks aromatic and basic amino acids. These proteins would be acidic with a low pI and may have trouble, given the lack of nonpolar aromatic amino acids, in forming a buried hydrophobic core which stabilize proteins. Nevertheless Longo et al were able to synthesize a protein with a slightly expanded set of amino acids (12, including Asn and Gln, with 70% prebiotic amino acids). 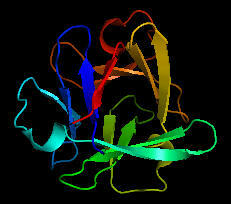 The structure of one of the proteins, PV2, is shown below. The protein was more stable in 2 M NaCl (compared to 0.1 M) in which it showed a cooperative thermal denaturation with a melting point near 650C using differential scanning calorimetry. The protein had properties similar to those from halophilic organisms that thrive in high salt. These properties include low pIs and high negative charge density, which allows cation-protein interactions in the high salt environment, and lower stability in low salt environments. Earlier oceans were saltier. Halophiles are an example of extremeophiles which are highly represented in archea. Although most halophiles are aerobic, some are anerobic. Perhaps life arose in high salt environments. Figure: Structure of PV2 protein comprised of a reduced alphabet of mainly prebiotic amino acids.